The Scarsdale diet menu and complete diet plan were created by Dr. Herman Tarnower (March 18, 1910 – March 10, 1980). The book “The Complete Scarsdale Medical Diet” was originally published in the distant 1978 by Herman Tarnower M.D. (as the author) and Samm Sinclair Baker (as the coauthor). Are you ready to start already? Take a moment to read Scarsdale diet review. I think you will find it quite interesting as Dr. Tarnower offered in his book not only easy way to lose weight but to keep it off forever through his Lifetime keep-slim program. Scarsdale diet menu does not require meal portioning. You can eat as much as you like until you are satisfied (not stuffed). Breakfast in Scarsdale diet menu is the same everyday. 1/2 grapefruit – the best fruit for breakfast! 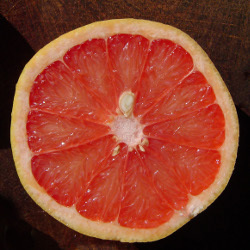 However if you don’t have a grapefruit at hand, you can substitute it for other fruit in season. One slice of protein bread, toasted, no spread added. Coffee or tea (no sugar, cream or milk, no honey). 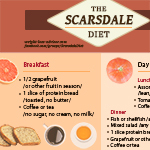 Thinking about going on the Scarsdale diet? This diet is not an easy task and by our opinion, it is hard to prepare and to follow. Can I take the honey and cinnamon tea with the scarsdale diet? Please send me a copy of Scarsdale diet to help my patient to reduce weight in an healthy way. Thank you so very much! Lunch and dinner on Tuesday is reversed. The lunch is supposed to be the dinner and vice vrsa. Who changed the diet menu?… I see the dinners and lunches have been switched around on at least a couple of days? The originator had a specific reason for the food combinations in his original menu… I’ve been on this diet 2 weeks at a time whenever I needed to the last 34yrs and works wonderfully just the original way…no one has the authority to rearrange it… Im sticking to the original menu because it really works ! Hi, I am 69 years of age, male, 5’8″ 210 lbs. My normal weight should be 180 lbs. I take low daily doses of 8 mg. of Atacand and 10 mg. of Crestor. Is there any reason I should not try the Scarsdale two week diet? Yes, origional diet definitely works. I lost 36lb in 4-5 months doing 2 weeks on one week off. The week off doesn’t mean you stuff yourself but you simply add jacket potatoes for example. This works for me as I have a slow metabolism and the 2 weeks on, one week off means my metabolism keeps working effectively. If you diet continuously your body gets used to the food intake, you have to keep kickstarting your metabolism to lose weight effectively and safely. I just can’t seem to take off my weight. After not being able to really move for a year because of lower back and sciatica. I have since had my back surgery but continge to gain weight. I need help. Please send me a copy of the complete diet. Please send an original format of the diet as I have used it in the past, (maybe 25 years ago, and did lose weight). This diet is very easy once you understand it. Meat, chicken, fish, coddle, tea, diet soda if you must. Sugar free grapefruit cups make breakfast fast and easy. Sprinkle toast with cinnamon and Stevia for a cancer fighting tasty treat. Cut out all fats. 2Weeks 20lbs. Works like a charm! You can do anything for 2 weeks! Remember, eat as much of meat, fish, and chicken as you like. This is the only diet program I’ve ever tried. It worked for me many years ago, plus, I love grapefruit. I’m going back on it today and I can’t wait to see the results. I’ve been on this diet before and it requires some will power but it’s well worth it once it’s said and done!!! This diet is my go-to and has been for 20 years. The weight literally falls off. You can’t cheat at all but all that protein keeps you from being hungry. I make a special tomato sauce that I use sparingly on everything and it didn’t seem to make a difference at all in the effectiveness of the weight loss. Just take a can of plain tomato sauce with nothing else in it at all, add some powdered ginger, black pepper, apple cider vinegar and no cal sweetener. Experiment with the amounts of things you add. I’m on it again now…7 pounds, seven days so far. Can I have a protein shake first thing in the morning before breakfast? This diet wasn’t to easy but in the last 6 days I have lost 10.8 pounds!!! I definitely got the results I wanted. I have also used this diet whenever I need to loose a few pounds. My mom used it back in the day and recommended it to me over 20 years ago. I’ve recommnded it to many friends and they love it too. It’s simple and provides fast results. I usually have four lbs less by Thursday morning of the first week. A big plus, it sort of resets any bad eating schedule I’ve fallen into. Last note: google the diet, I agree that some sus are switched out above. I first went on this diet back in 1979, lost 48lbs in 3 months, 2 weeks on and 2 weeks careful. I never regained the weight as I just went on the diet for a few days whenever a lb or two crept on. I can genuinely recommend this diet for a good result. I prefer to stick to the original diet whenever I have to use it.